WiseLED manufactures searchlights, flashlights and dive-torches, and our main service center is located in Gilleleje, Denmark. WiseLED provides LED light solutions with unique performance and technology, constructed for the most demanding environments. 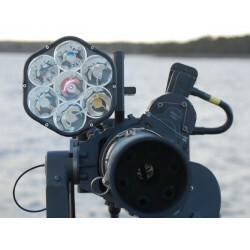 The WiseLED Xtruder ST LED remote operated Searchlight is a unique stabilized lighting platform providing the operators with the best performance and capacities beyond all other existing solutions. Optimized for land , sea and airborne operations, the Wireless remote tracking functionality gives the operators in-field advantages never seen before.